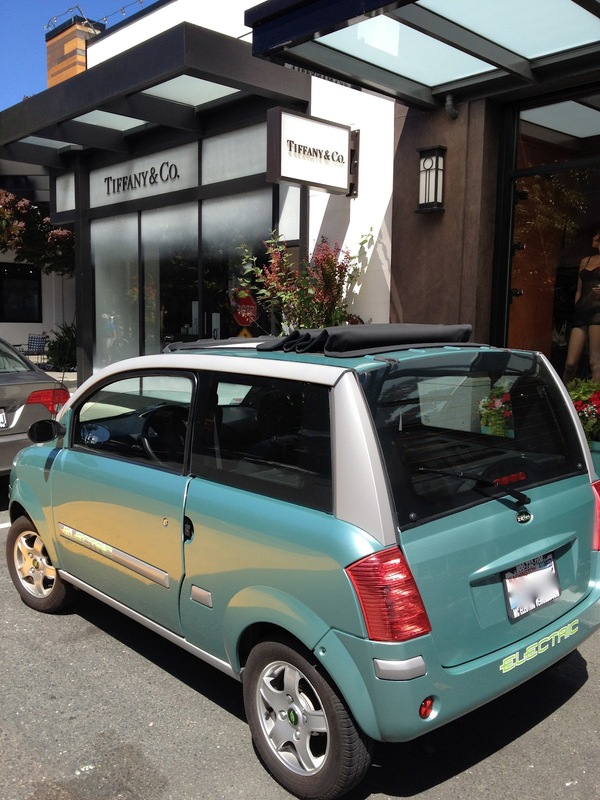 the happygirl: is this the happiest little car in the world? is this the happiest little car in the world? When I was growing up in Massachusetts there was a woman we would see every now and then who drove a metallic turquoise Karmann Ghia. We'd see her flying down Memorial Drive, her blonde hair in a tangle blowing in the wind. I wanted that when I grew up. The whole thing. When I turned 17 I told my mom that my first car would be a Karmann Ghia. That did not happen. I got what most kids get, a safe car, a blue Toyota, a car my mom felt safe that I would be driving in down the Mass Pike. That Karmann Ghia never did leave my mind though. A few years ago I looked into finding one but there was never the right one. Yesterday, however, I think I may have found the the happiest little car I've ever seen. As I was crossing the street at an outdoor shopping mall, I saw a woman drive up and as if in a Rob Reiner comedy, find one of just a handful of parking spaces directly in front of the stores. And there it was-- a metallic Tiffany blue car parked in front of Tiffany's. I crossed the street and stopped her as she got out of her car. "Hi. Oh my God, what is this car?" "The Zenn," she said. She was blonde, smiling and happy. While it looked liked angel beams were shining down on her as she parked, it turns out those were just sunbeams. The entire roof of the car rolls back into one giant sunroof, making it almost a convertible. On her passenger seat was a rolled yoga mat. The interior of the car was open and sunny, plenty of room for two and cupholders. There was no backseat, but there was a nice storage area in the back. I asked her to tell me about the car. She told me that the Zenn (Zero Emission No Noise) is an electric car with a range of 40 miles. It is classified as a Neighborhood Electric Vehicle that tops out at a speed of 25 mph. This is the car you get when you just need to drive around town. I asked what happens if she tried to go more than 25mph and she said the car was sort of like a glorified golf cart and programmed not to go more than 25 mph. It can't go more than 25mph. I've been test driving some electric cars in the past few months and I have felt range anxiety as I watch the energy/range meter deplete showing just how far I can go. The driver said she doesn't have that anxiety since she just drives around the city and doesn't take highways. With all the steep hills in Seattle, I asked her about the horsepower getting up these hills. "Not a problem," she answered. "The car has plenty of get up and go." She loved the car. She was happy. It made you want whatever she had to give her that glow, that bounce in her step. Maybe it's the fact that the Zenn cost approximately $100 a year to operate. Maybe it was the yoga. Maybe it was the good karma coming back at her since she's driving a zero emissions car. Whatever it was, I really wanted to say "I'll have what she's having."